Left to right: Eric Anderson, Steve Ott, Aaron Graham, Aaron Taylor and Chris Dishman. Chris Dishman: We would run a practice and that was 120-some plays. Basically two games. I think we would have 30 plays at each station, so it was like almost 150-ish plays each practice. And they’d take probably 98% of them. (laughs) I’d get maybe one or two plays and they just wanted to push through the whole thing. And it wasn’t like Coach Tenopir wanted a regular rotation either, he’d just say, “Give those guys a blow.” And they never wanted to give anybody a blow. And I think I took that mindset to the next level. When I’d gone to the Senior Bowl and the NFL everybody was like, “What’s the rotation?” And I was like, ‘Rotation? Just give me a break when you need to give me a break,’ you know? And they were like, “What do you mean?” And I was like, ‘I’ll just go until you want me to come out.’ Seeing that work ethic? 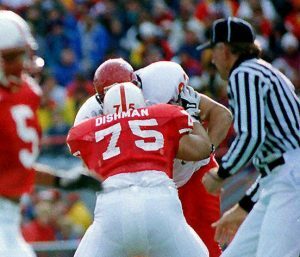 When I got to the NFL it made me realize those guys at Nebraska took things to a different level. Q: Was it ever spoken about? 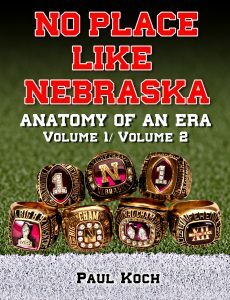 Q: When you got to that next level what stood out or revealed to you that Nebraska had been a little different, a little special? CD: It was more physical at Nebraska. The practices were a lot more physical. They try to save everybody’s body in the pros. When I was first a rookie I was more like, ‘Why don’t we just take them to the ground?’ You know? And the older and older I’d get the more I liked that rule. (laughs) By the time my eighth year rolled around it was like, ‘Don’t touch me, rookie.’ (laughs) Because you know the older you get the more you didn’t want anyone touching you. But coming from Nebraska where we went full contact and took people to the ground -we cut our defensive linemen and we cut linebackers at full speed- we did things that normal teams don’t do in practice. We basically practiced like it was a game tempo every day. Heck, we even went full pads on short yardage situations, in full pads some Thursdays. Days where some people thought it was like a walk-through? We would go ‘live’ on those days, too. It was just a different mentality and a different way to prepare, and I think it did well for us. And interestingly, it needs to be done that way in college. You have to go ‘live’, you have to practice fast. The kids at my high school, they don’t know the difference between tempo, being where you need to be, working on your technique. High school kids are just like, “Hey, we had prom three months ago, we need to know how to hit.” They’re not able to just turn it on on Saturdays, so we practiced game speed all the time. Q: For the uninitiated, what is a cut-block? CD: A cut-block is running full speed and basically putting your shoulder right into someone’s kneecap and trying to take them down. When we ran a lot of option we were always trying to get to the corner, get to the outside, so we’d try to take on that linebacker. And a lot of times when you tried to take them on high they’d juke you and throw you out of the way because they were more athletic than you. So basically you take all the ‘jukiness’ out of them by putting a shoulder into their kneecap. Either they’re gonna blow their knee or they’re gonna fall down on top of you. Q: You took advantage of their desire for self-preservation? CD: Yeah, they’d have to definitely think twice about what they were going to do when they played against us, you know? 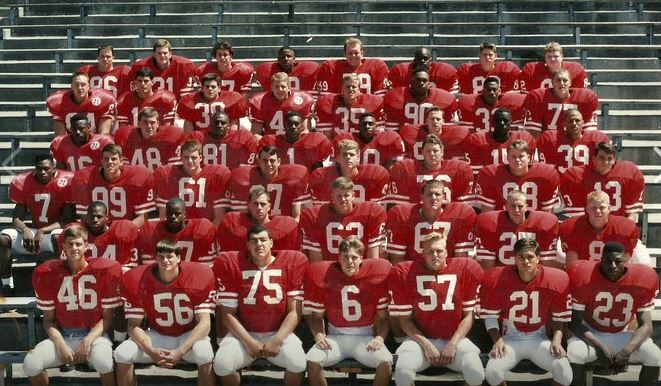 Q: Was that pretty distinct to Nebraska at that time or did a lot of teams do that? CD: Yeah, we cut-blocked a lot at Nebraska. Even on the line of scrimmage we cut blocked. With the option the more people you get on the ground the less people they have to catch the running back. That was our philosophy. We didn’t always say they were pancake blocks as much as they were knockdown blocks, because we’re not actually trying to literally drive them back and knock them on their backs, we just wanted them on the ground so there was a lesser chance they could put a hand on our ballcarrier. You know, we’d cut people at the line of scrimmage because a lot of plays we’d try to get to the corner and use our speed with our I-back and quarterback, to get out to the corner and make things happen out in space. Q: I’m trying to recall: were you in there for Tommie’s long 75-yard touchdown run against Florida? CD: You know, I was actually off on that play. I was in and then Adam Treu came in. (Me and Adam would do spells.) I would start at left tackle and then go to left guard, and then Aaron Taylor moved to center. We kind of had a little rotation going there that year, which was weird. But I was actually out on that series. He went down the right side on that run. Q: I was watching that the other night and there were so many different numbered jerseys flying around on that play. I had a hard time figuring out who was in on it. 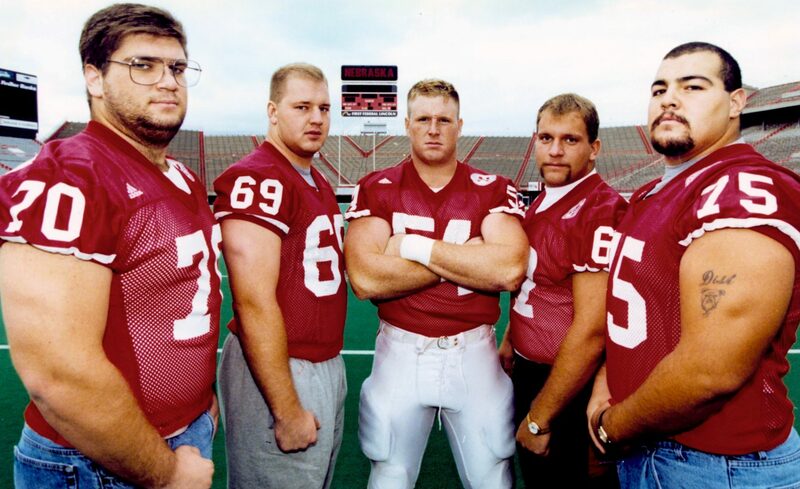 CD: I think it was Aaron Graham at center, Aaron Taylor at left guard, Adam Treu at left tackle, Steve Ott at right guard, and Eric Anderson at right tackle. Q: What was it like for you the year after Wiegert, Stai, Wilks and Rob Zatechka left? CD: The line left. The original Pipeline? They left. They laid a good foundation for us and they were just of a different build. A lot of them were tall. Zach and Brenden and Rob and all those guys were 6’4”, 6’5” bodies, all taller than the next group of us coming in, and everybody thought that was going to be the big question mark, “There was no way we could match up to what just left.” We kind of took that as a chip on our shoulder. We knew we were probably a little more athletic than those guys, but we were smaller and we weren’t as big and long. We were just short, basically looked like little cookie-cutters as far as body-style, we were just little blocks. (laughs) We knew our body style was more matched to the style of football we played and that would work. We cut-blocked and we were able to get out on a linebacker quicker. After that first game where everything was going well -and I remember me and Aaron Taylor, we were talking before that first game, the Arizona State game, and we had to make sure that people realized that even though the old Pipeline left we weren’t going to let this thing fall off- we had something like 630 yards that game or something like that. Q: And Chris, is it your belief that the ’95 team was one of the best college football teams of all time? CD: Yeah, at the time I probably wouldn’t have said that, but the older I get? You know what they say, “The older you get the better you were?” (laughs) Looking back and realizing how each game we would go in and just dominate in every aspect of the game, it’s just unheard of now. The parity in college football is right here, everybody’s the same, but for some reason the stars lined up and we were blessed with Tommie as our quarterback. We had three deep at running back with Ahman and Lawrence and Damon Benning. We had a bunch of ankle biters out there at receiver that were probably better blockers than we were: Brendan Holbien and John Vedral. I think they had more blocks than we did. They’d line up out there and they knew their role on the team. They weren’t going to catch a pass and they bought into it, and they just beat the crap out of the other teams’ defensive backs. We were gonna run the ball and just come right at you, and everybody bought into it. And defensively, with Jason and Christian and the linebackers with Terrell Farley and Phil Ellis -Phil Ellis might be the best middle linebacker I’ve ever played against- even with the pros, I think. Phil was probably one of the hardest hitters and most athletic middle linebackers I’ve played against. I think if he would have went to the NFL he would have played a long time. He was so much quicker going downhill and he could hit. Q: Wow, that’s quite a compliment. Q: And tell me about the offseasons. After ’94 happened, I suppose most teams kind of sit back, relax and get a little lazy, but what do you think made you guys push so hard for the ’95 season? CD: I think the foundation was set when we first got there. Everybody worked hard. Just because we didn’t win that ’93 game. And we were in that game. We had our chances. When Byron Bennett missed wide left we were so close to winning the championship that year, but I think the work ethic those guys instilled in us from the get go. When we won in ’94 it was a great feeling, but like Coach Osborne said, “In a couple of weeks we’re gonna start up again.” The train kept on moving, you just got back on your saddle. You didn’t gloat in what you did, you went to work. And I had two years left and I wanted to make the best of those two years. But the people that came before us? The tradition, the work ethic they instilled in us? You don’t settle for just winning one big game, you win them all. Q: Any upperclassmen have a real big impression on you as to their intensity and dedication? CD: Everybody. Stai and Wiegert and Rob Zatechka and Joel Wilks, all those guys made an impression on me. They pushed themselves, even in the offseason, going through drills. The intensity was where you’d push yourself to a level as hard as you could. I remember lifting, when we’d do circuits in the morning. Us linemen would go around 6 or 7 in the morning. I remember we’d do the circuit lifting and there was twelve or thirteen trash cans there, and I probably puked in every single one of them. You pushed yourself to exhaustion and throw up and then keep going. They put trash cans out there for a reason and pretty well knew people were gonna puke, and that’s what we did. A lot of people don’t know how to push themselves to where everything is coming back up, but that’s just an example of our work ethic. Q: Was that the old Metabolic Power Circuit you’re talking about? Q: Is there a most memorable play, a favorite? CD: I think the favorite for me was my sophomore year. We were playing Miami in the first national championship game. Pretty much the whole year I got in scrub duty when the game was out of hand, when we were winning by so much, but for some reason in that Miami game it was the first or second quarter and I guess Coach Tenopir wanted to say something to Rob and I heard, “Dishman, get in.” And I’m like, ‘Are you kidding me? This is a national championship game and we’re down. It’s not like we’re up by 50 here.’ (laughs) So I remember going in and that whole series we went down -and I think it was my first play and I had to pull off a counter sweep, and I pull to the right and I’m playing left tackle (and that was the time when they moved Brenden Stai over to left guard from right guard)- so it’s a counter sweep call. And Aaron Graham doesn’t step flat enough to get Warren Sapp, and I’m in my mid-pull step and Warren just ear-holes me and drives me back and throws Lawrence Phillips on the ground for like a six yard loss. It was my fist time getting in to play in a primetime situation and I’m like, ‘Are you kidding me! ?’ You know? ‘Jesus, I just got embarrassed on TV!’ Coach Tenopir let me in the game for that series where we went down and drove and scored in the corner there, and I think we were down 10 to 7 at that point, now. It was the drive that actually meant something during that game. That was the most memorable series I ever remember being in. Q: I remember that play, too, the one for the loss. 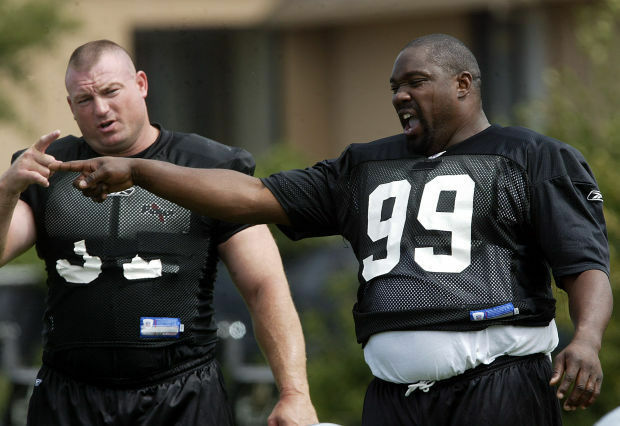 Q: Sapp was a pretty special player, no? CD: Yeah, he was the real deal. I got a chance to play against him a lot in the pros, too. He was a heck of a three-technique defensive tackle. Wasn’t much of a defensive end, but he was pretty good at defensive tackle. Q: Did you ever talk to him? CD: No, not really. In the pros you don’t really talk to a whole lot of players. The ones in your division, maybe you talk to a little more. People think it’s trash talk and whatever, but it’s usually more like, “Hey, how’s your family doing? How are the kids?” You know? Q: Did you ever line up against other Huskers during your time in the pros? CD: Oh yeah, I went against Parrella and Wistrom and Jared. I went against them all. Parrella was tough. Wistrom and Jared played outside -they played defensive end and I played guard- but in third-down situations they’d move in a little. It was pretty fun going against them. We’d talk smack, and they’d get the best of you and you’d get the best of them. You just tried to win more than you’d lose. Q: Just like the old days, huh? CD: I went against Christian a lot, too, because we played the Giants in our division. So I went against him twice a year, too. (laughs) It was fun. Q: And Chris, any memorable off-field incidents? CD: Off-field occurrence…hmmm. Ones that I can talk about, huh? (laughs) I don’t want to throw anybody under the bus. There were so many good memories about college, I can’t think of any right off the bat. And a lot of people during their college years went out and partied and everything. But I went and had a daughter my junior year. My wife -who was my girlfriend at the time- gave birth to our daughter in June, so my senior year I basically didn’t eat at the training table because I had my daughter at home with the babysitter. And I’d come home and make dinner for the babysitter, so basically my whole senior year I was pretty involved there. From 20 to 21 years old was a hard age: I didn’t go out and party or anything like that because I had a pregnant wife and then a daughter. I lived with my wife and never went out after my daughter was born. 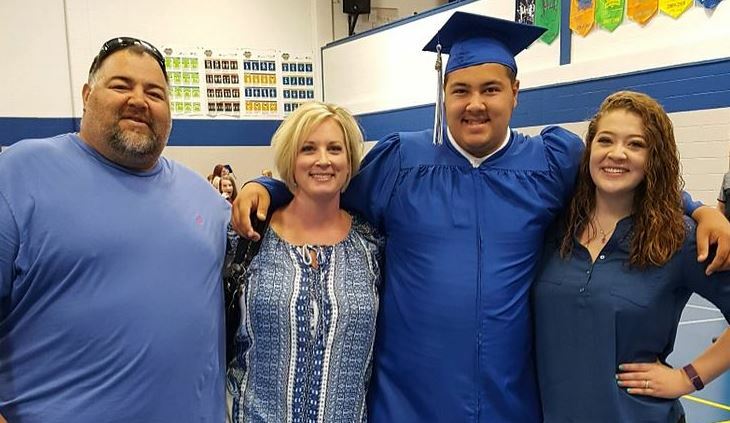 Q: You were a full-time football player, full-time student and full-time dad? CD: Yeah, pretty much. Most people have those college years where they rip and roar and have all these wild stories, but I pretty much stayed home. That was just me. I guess I had an option, but I chose not to and that was my life and I loved it. Q: That’s the best part, Chris: Loving it. CD: Yep, wouldn’t change it for anything.